The last class was Traci Bautista‘s class called “The Artful Wall”. 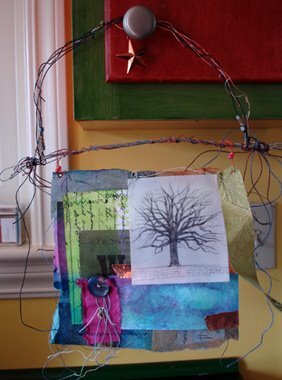 I took this class because it involved sewing and I really wanted to see combining sewing and textiles into artwork in action. I even brought my sewing machine for this class! Luckily the woman sitting next to me, Melanie of Navy Lane Studio helped me with figuring out my machine. I loved her wall hanging she made and she was so nice and helpful and didn’t make fun of me and my total lack of sewing knowledge. I was really out of it for this class. I was tired and just brain dead. But Traci was a great teacher and my blahness had nothing to do with her. She really showed us a lot of her techniques and gave us a lot of little goodies as part of our kit. We dyed papers and paper towels with Liquid watercolor paints. Created monoprints. Made fusions with glue on freezer paper with our paper towels and other collage bits. Then we sewed out bits and pieces together to make a wall hanging. Here is my sad wall hanging. I have it hanging from a cabinet in the kitchen right now. I don’t really like it. At all, actually. But that’s ok. I learned some really interesting techniques in this class and that’s all that matters. The thing that was great about this class was that everything we used was cheap! Paper towels, foam brushes, cheap student grade watercolors, elmer’s glue, thrift store clothing scraps, buttons, beads. Part of my problem I think is that I don’t do “joyful” very well. ha! Traci’s style is definitely playful and joyful. And I like it, but I just can’t do it. Which is fine. I don’t take these classes to create copies of what the instructors’ artwork. But in class I was surrounded by these vibrant works springing up all around me and I tried to do it too- and it just kind of didn’t work. But I can’t wait to incorporate the different techniques that she showed us into my work in my own way. It’s good to be out of one’s creative comfort zone. And I definitely was. I would like to make a happy wall hanging for my nieces though. I think they would like it. Actually, I should do it with them when they come to visit. That would be so fun! Traci came up with these “cheap” techniques because she works with kids and has a budget of almost nothing to work with. Necessity is the mother of all inventions. ? Is that how it goes? Well, whatever the saying is, that’s definitely true. Making do with what you have and making it go further. This new piece certainly doesn't look sad to me - it looks FANTASTIC! It was so great to meet you at Artfest! Thanks for reading my blog...I've bookmarked yours...LOVE your stuff! D.
I love it, Bridgette... I think it turned out wonderful! I agree it is tough working in a classroom without my usual tools and supplies, but it was definitely a good challenge. You should try something like this again, in your own way like you said, I bet it would be amazing. So glad I got to meet you!